The Fab Fit Fun Spring box has been released, and there is a new promo code you can use to save on the Spring Editors Box right now! Get your 40% off discount with Promo Code SUNKISSED here (and they ship for free). 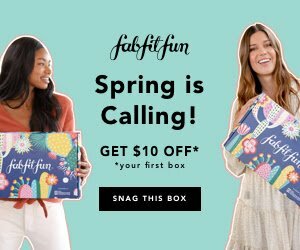 The Fab Fit Fun Spring box is full of over $200 in items (fashion, beauty, and fitness finds ), for $29.99, with promo code. It is regularly priced at $49.99, and this is one of the best deals we have seen for the Fab Fit Fun boxes. It is a great offer! If you have never heard of Fab Fit Fun before, they are seasonal subscription boxes (they are released in Spring, Summer, Fall and Winter), full of really great beauty finds. They typically come with 8 to 10 items in each box. One of my favorite things about these subscription boxes, is that they come with full size items of quality products. I am still using items from previous Summer and Fall boxes. One of my favorite lip pallets that I use daily, is one I discovered in the Fab Fit Fun subscription box. You can read our review of one of the Fab Fit Fun summer boxes here, or watch our video review of the Fall box below. Review of the Summer Fab Fit Fun box, I loved it!Not only do I love the items for myself (it is such a treat to get all of these great items in one box for that price), but it also is great to give as gifts. You can gift the full box (by either sending the box to their address, or getting them a gift card to send one to themselves) or you can subscribe to the box yourself, and then save some of the items out of it to gift to others. This is why I find it such a great value. With my previous boxes, I have picked out 3 or 4 items I loved for me, and then made various gifts for others out of the other items. I was able to put together such a fun gift bag for my niece in college, by doing that – and she loved it! The also now allow you to customize boxes. You can select certain items you want in your box, so its not completely curated by them. If you are an annual member, you get to customize your box 3 days earlier then it is open to all. That lip pallet you see on the top of this box is one I got in a previous box, and still use daily to this day. I love it. I was able to stop buying lipstick, because it has all the colors I need, and they stay on great. Just a couple finds like that in the box, more then pay for it, but it comes with so much more. Get your 40% Off discount on your FabFitFun Box with Promo Code SUNKISSED here. Stitch Fix review – Let a personal stylist pick clothes for you – only keep what you love!